Doug Ford is the only official candidate in the race, so far. 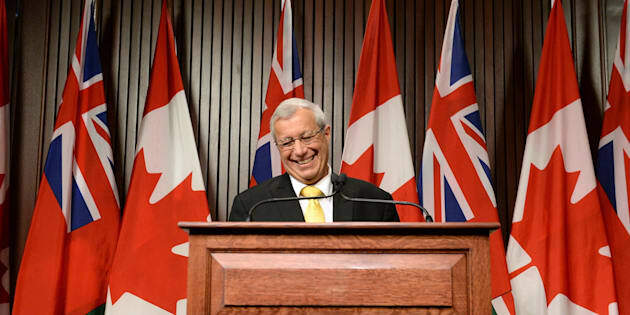 Ontario PC party interim leader Vic Fedeli speaks at a press conference after a caucus meeting at Queen's Park in Toronto on Jan. 26, 2018. TORONTO — The newly appointed interim leader of Ontario's Progressive Conservatives says he won't make a bid for permanent leadership of the party. Vic Fedeli says he is focusing on dealing with infighting and fixing issues within the party ahead of the upcoming provincial election. Fedeli says he plans to "root out the rot" from the party so that its candidates can enter the campaign with confidence. The party has been in turmoil since last week when its leader Patrick Brown resigned in the face of sexual misconduct allegations reported by CTV News, which he vehemently denies. The allegations have not been independently verified by The Canadian Press. The party's executive announced on Friday that there would be a leadership race before the spring election, overruling the caucus's recommendation to have Fedeli stay at the helm. Fedeli initially declared his intention to run in the leadership contest before reversing course today. His announcement comes amid speculation over potential leadership candidates. Currently, only one — Toronto politician Doug Ford, brother of the city's late former mayor Rob Ford — is in the running. Meanwhile, the Progressive Conservatives have shuffled their critic portfolio, with Fedeli saying Tuesday he has appointed three of the party's caucus members to new critic roles. Lisa MacLeod will take over from Fedeli as the party's finance critic. Lorne Coe will become the party's education critic, a role previously held by Brown, and Lisa Thompson will become the party's caucus chair. Fedeli says Thompson will play a key role in implementing a plan to strengthen workplace violence and harassment policies.